Hiring reliable art shippers to ship a painting can be costly. However, it is not the case if you deal with Fine Art Shippers! As an experienced fine art shipping company headquartered in New York, we pack, crate, move, and install works of art on a daily basis, working with art business professionals from around the United States and beyond. Among our clients are many leading auction houses, popular galleries, talented artists, art dealers, and private collectors from all over the world, who entrust our team with shipping artwork of any kind. Hence the question: why are our art moving services cheaper than those offered by many of our competitors? To ship a painting with Fine Art Shippers is always beneficial to our clients for a simple reason: we are a family-owned and family-operated company with a small team of experienced art handlers. This allows us to keep our rates lower and continue to save our clients’ money on shipping fine art and antiques both nationally and internationally. Along with that, it does not mean that we cannot handle large moving tasks. In fact, no job is too big for our team, so whether you need to ship a painting by Picasso or move the entire collection of art, Fine Art Shippers can help you with that in the most cost-effective way possible, without any hidden fees and charges. We can pack and ship a painting of any size and medium, from watercolor and oil paintings to encaustic art and large three-dimensional paper collages. Since we operate both across the United States and internationally, we can ship a painting to literally anywhere in the world, so long distance is not a problem for our team of art shippers. 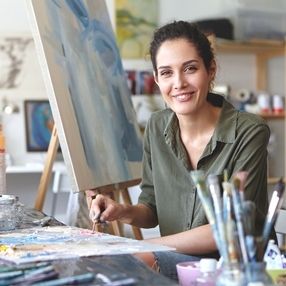 Fine Art Shippers can help you choose the right art insurance coverage for the artwork, which meets all your needs and requirements. We provide free instant quotes, so do not hesitate to contact our team or simply fill in a special form on this website. As you can see, to ship a painting with Fine Art Shippers is indeed affordable and beneficial to our clients, and we are very proud to offer high-quality services at reasonable prices. Just tell us about your shipping problem, and we will solve it for you quickly and efficiently while staying within your budget!